Hi, my name is Jim Lee. When I first learned how to do the DoubleThump, it took me over 8 weeks… my video tutorial will show you how to do it in less than 8 minutes. This bass guitar speed technique can be used with almost any style of playing: from chords to intricate bass lines. I like it because you can play 2x faster with less effort. Here’s a sample of me playing using this technique. There’s no risk because I offer a 100% money back guarantee. "the double thump technique is awesome!" "Good job Jim! I can do this bass technique pretty well now!" "I am impressed! 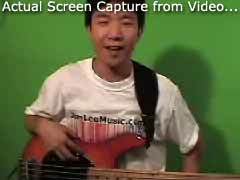 Mr. Lee is excellent and demonstrates Bass can be fun!" "I've been playing bass for over 20 years and I want to thank you for teaching this old dog a new trick"